If you live in the Chicagoland area or are planning to visit and would like to attend a taping of "Judge Mathis" please call: 1-866-3-MATHIS to make a reservation. 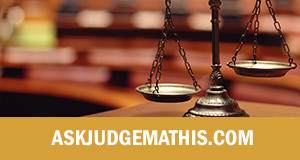 By obtaining tickets to "Judge Mathis," you consent to be photographed by means of video recording and you grant the producer of the footage, its successors, assigns, carrier stations, network station(s), sponsor(s) of the program and advertising agents (as well as their affiliated and related entities) the right to record and use your name, voice, and likeness worldwide in perpetuity for any purpose whatsoever. In addition you release the above parties from any and all liability for loss or damage to person or property while at or around the premises, and you agree to comply with all rules and regulations of producer. As ticket distribution may be in excess of studio capacity, admission is not guaranteed. If we are able to provide you with tickets we will contact you.